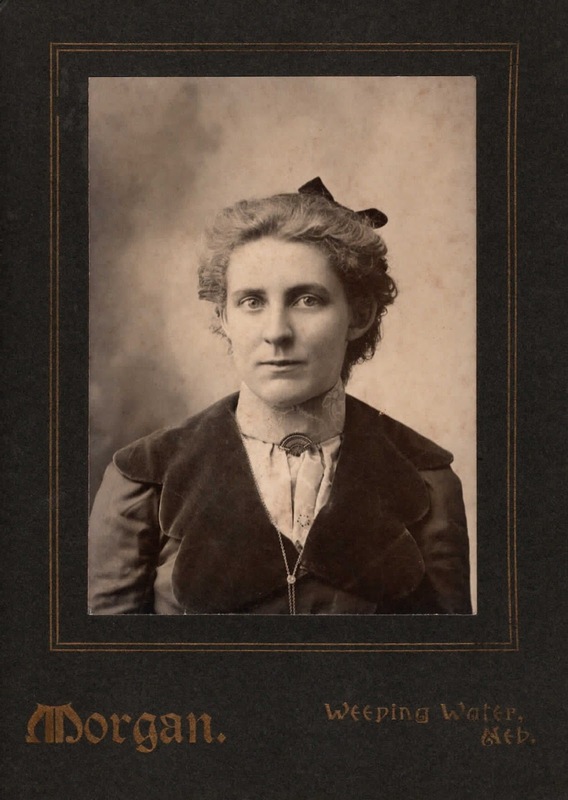 in this collection of photos and memorabilia. 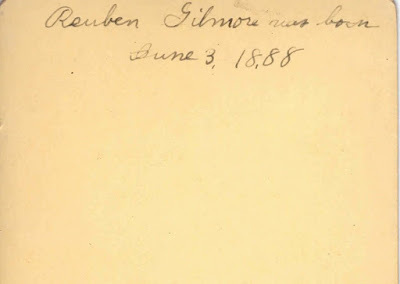 Reuben Gilmore is a nephew of Margaret Hampton Hoover Gilmore. The photographer mark says Merriam, Weeping Water, Nebraska. 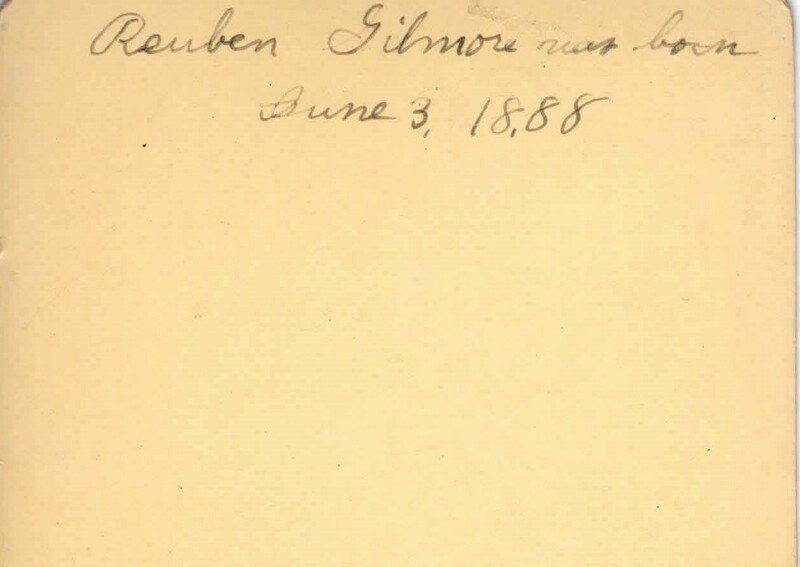 The back is inscribed Reuben Gilmore was born June 3, 1888. 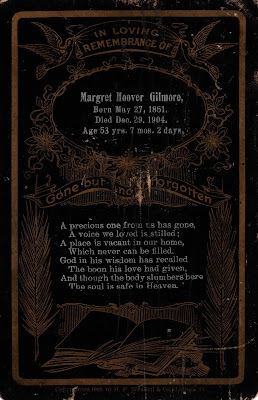 Parilla Alma Hollenbeck Shelhorn AKA Rilla Hollenbeck Shelhorn is a niece of Margaret Hampton Hoover Gilmore. 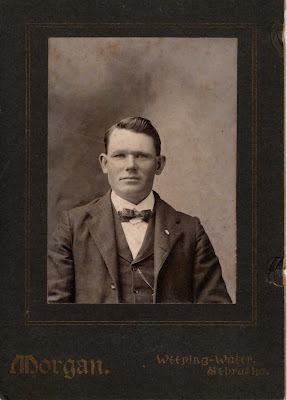 The photographer mark says Morgan, Weeping Water, Nebraska and the mounting card is identical to the photo of Raymond Gilmore. 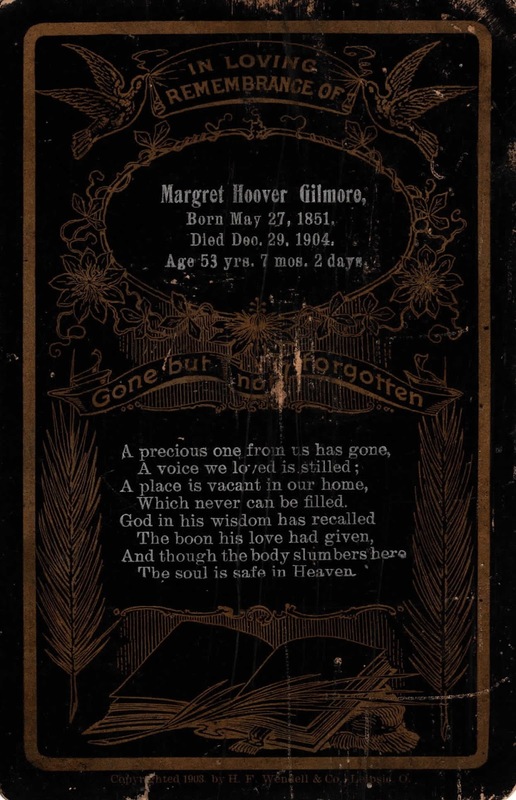 Raymond Franklin Gilmore is a nephew of Margaret Hampton Hoover Gilmore. The photographer mark says Morgan, Weeping Water, Nebraska and the mounting card is identical to the photo of Rilla Hollenbeck Shelhorn. 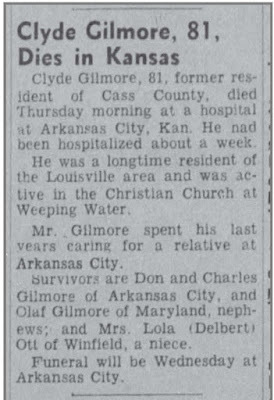 The photographer mark says Jones, Chillicothe, Missouri and the back of the photo says Clyde Gilmore. 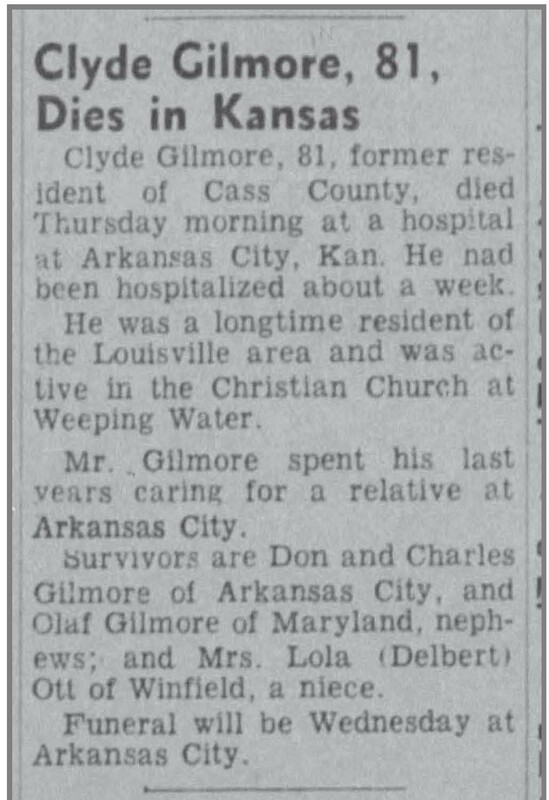 Chillicothe, Missouri is about 200 miles away from where Clyde Gilmore lived in Weeping Water, Nebraska so it seems most likely that he was on a visit when this photo was taken. 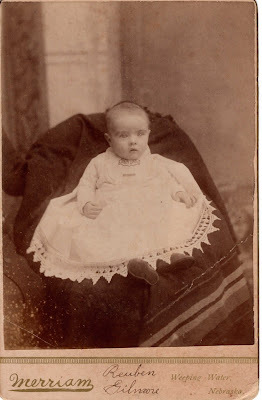 There is an unidentified boy in the photograph. 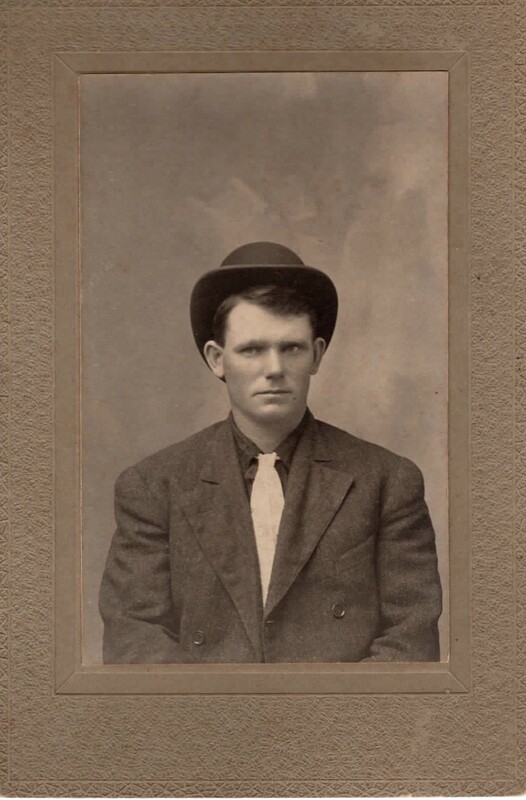 There is an unmarked photo with a man wearing a hat who looks very similar to both Raymond Gilmore and Clyde Gilmore. In addition to photographs and the funeral card there were also two ribbons that were part of this heirloom collection. The first ribbon has a medal inscribed Hastings, the Queen City with the Odd Fellows fraternal symbol. 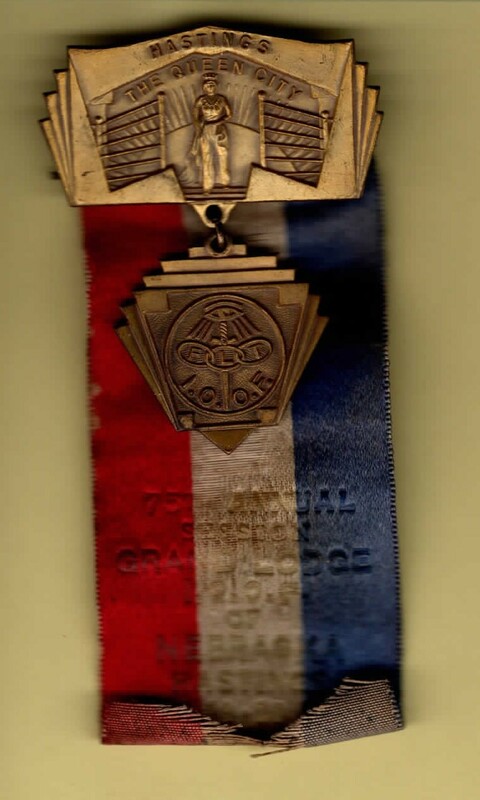 The ribbon states 75th Annual Session Grand Lodge I.O.O.F. of Nebraska, Hastings, Oct. 19-20, 1932. Another photo of the I.O.O.F. 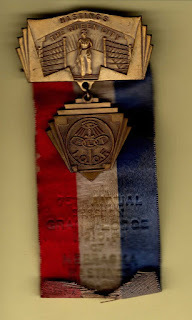 Medal/Ribbon shows that the ribbon is curling on the end. 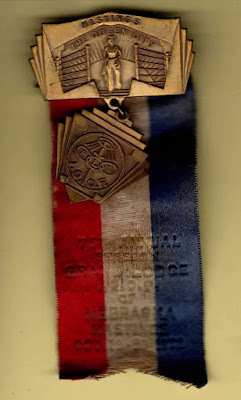 The second ribbon states Annual Log Rolling M.W. 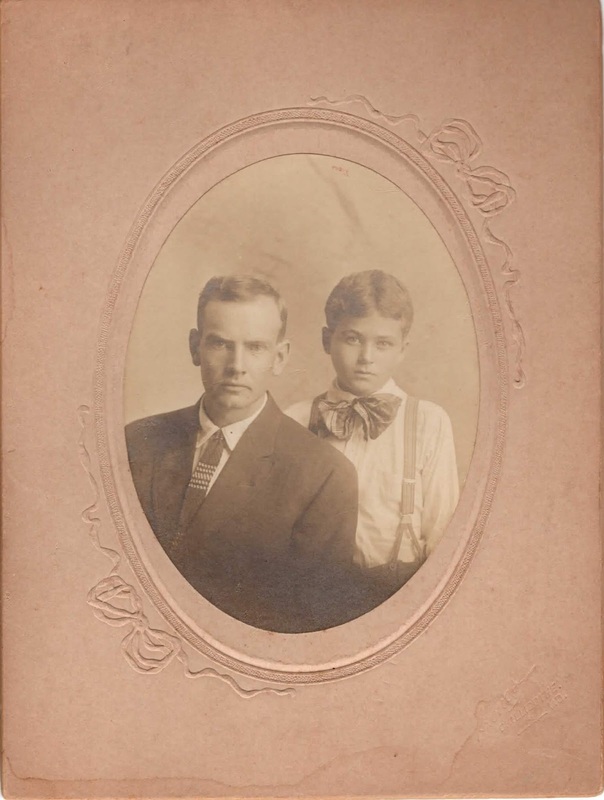 of A., Modern Woodmen of America, Butler Camp, No. 748, Weeping Water, Nebraska. 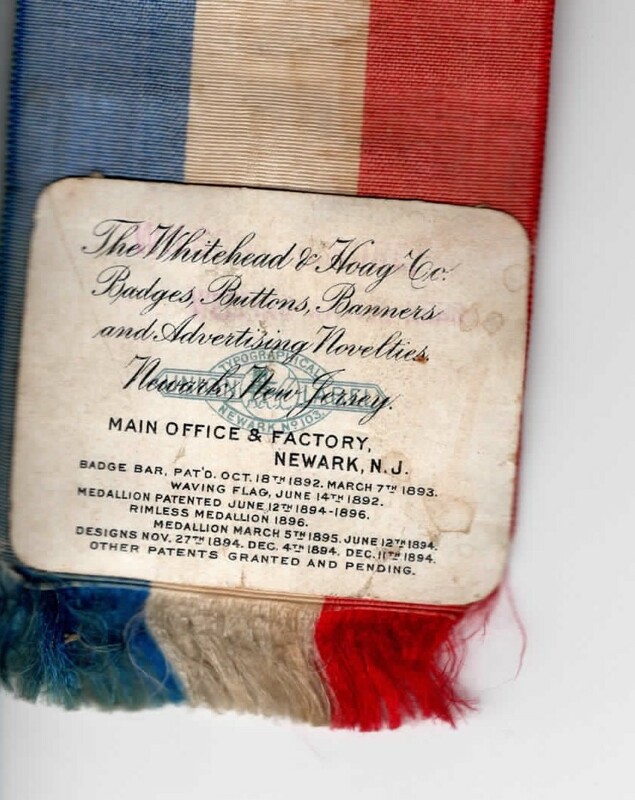 This last photo shows the back side of the Modern Woodmen Log Rolling ribbon with the manufacturer’s information.